A wall that is solidly connected will have no defects. Here the wall is perfect, while the wall has an obvious defect, at a. There are two extra stones - balanced by the two stones, you might say. The fact is that Black's right-hand formation is noticeably worse. 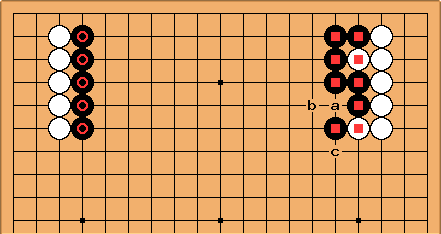 White may be able to exploit a, either by a peep at b, or in the course of a pushing battle started by White at c.
It would of course be absurd for Black to play at a, before being forced to. That is, sometimes one has to live with imperfections caused in walls, because solid connections are too slow-moving. for a number of very well known positions after common joseki. 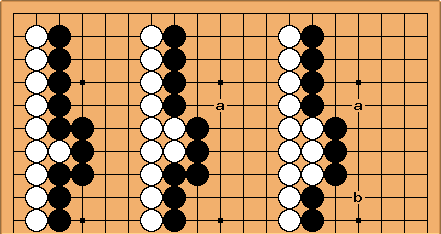 How should White play to use the fact that was played on the second line? 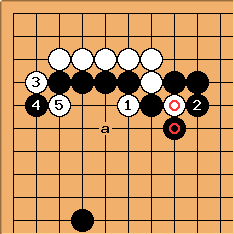 Here in fact White at a is a move of high value. But White has a more severe way available. In this case White has a strong attack with the clamp . It aims at all four circled points. Black cannot really permit White to cut with atari. Typically Black will connect at . Then gives Black bad shape. This results in two heavy groups fighting it out on the upper side. 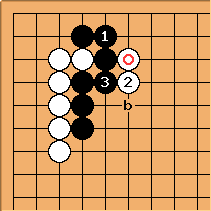 White could play the lighter way with at b; then Black can play at and give White some cutting point defects. This is based on variations from 4-4 point low approach, two-space high pincer with side stone. 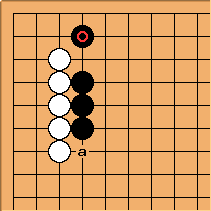 There are two defects here: White can play at the table point a to cause trouble later; and White can pull out? the cutting stone , possible bringing the stones under attack. Note that to capture in a ladder is an overplay here. is severe. In fact Black is in trouble immediately if and follow. 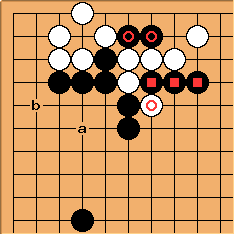 This for comparison is the result of a joseki that is out of fashion with the pros. Here the table point defect at a is more serious than in the previous case, because it is also the centre of three stones and Black can suffer from immediate shortage of liberties. 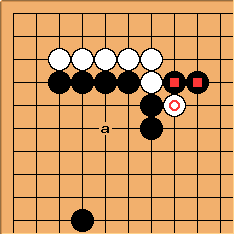 Normally therefore Black responds at b, when White plays at a. On the other hand, the stones are less likely to become weak, because the sacrifice stones give Black a number of possible kikashi on the upper side. Therefore is less immediately significant. I've also been told to generally treat the peeps against the defects as throw-away forcing moves to support an invasion. This of course is true, unless the defect is actually a valid cutting point, requiring no peep. Charles Beware the raw peep!